Aerial view of the Cana Island Lighthouse. ^ a b c Light List, Volume VII, Great Lakes (PDF). Light List. United States Coast Guard. Wikimedia Commons has media related to Cana Island Light. Rowlett, Russ. 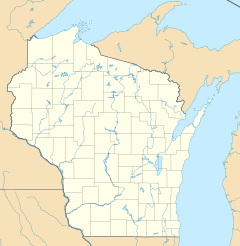 "Lighthouses of the United States: Eastern Wisconsin". The Lighthouse Directory. University of North Carolina at Chapel Hill. "Historic Light Station Information and Photography: Wisconsin". United States Coast Guard Historian's Office. Light List, Volume VII, Great Lakes (PDF). Light List. United States Coast Guard. 2006. This page was last edited on 18 November 2018, at 17:15 (UTC).